babienko architects revitalized this single story home in one of Seattle’s most desirable neighborhoods. The previous owners made modest attempts to update and maintain the home over the past twenty years but failed to realize the true potential of the property. 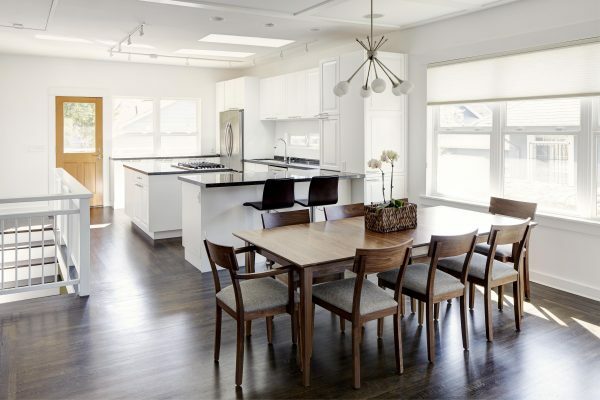 With surgical-like precision babienko architects stripped away years of disrepair & unsuccessful improvement attempts and breathed new life into this short-sale, creating a clean, contemporary home. Removing interior walls opened and connected spaces throughout the house. Adjacent to the new kitchen, a new open staircase to the basement was constructed to replace the formerly impassible stairs. A non-functioning fireplace & chimney were demolished in the living area and window locations adjusted for a new media center. An open carport was created by removing two of the garage’s perimeter walls, making it possible for a car to actually fit in its intended location.